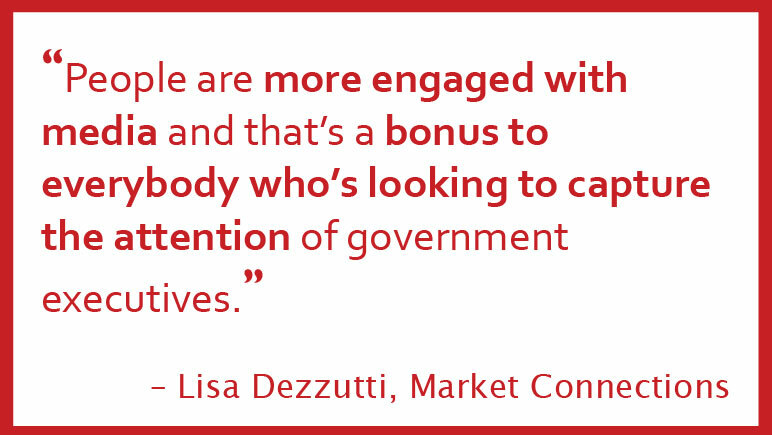 Following up on the 2017 Federal Media and Marketing Study presentation from Market Connections, I decided to reach out to CEO, Lisa Dezzutti, to dig a little deeper into this year’s research results. Having seen her lead the wonderful organization for so many years, it’s always a treat to hear firsthand what she’s learning. Q: How do you approach the arduous task of determining what changes will be in the next survey? A. We really do the same thing we encourage our clients to do. All year long, we ask for input and feedback. We talk to marketers who are in the trenches. It starts as soon as our annual event is ending. As people are mingling around, we start asking, “what is it you would like to see next?” Throughout the year, as we attend various events and talk to clients, we listen. We bring all of that back to the table and review as a team to see what makes sense. You can’t include everything. Some years we drop a couple of questions and substitute in something a little fresher, while keeping the same core questions year to year. Q: Were you surprised by the reactions to the questions on fake news and trusting sources? A. We were all very interested to know what the responses would be. We guessed that it would have some impact, but it was even higher than what we expected. If this had been a consumer survey, we would have expected it to be high. We thought perhaps, this being a B2G survey, that it would not be as high; but it was almost on par with what the general consumer sentiment is. 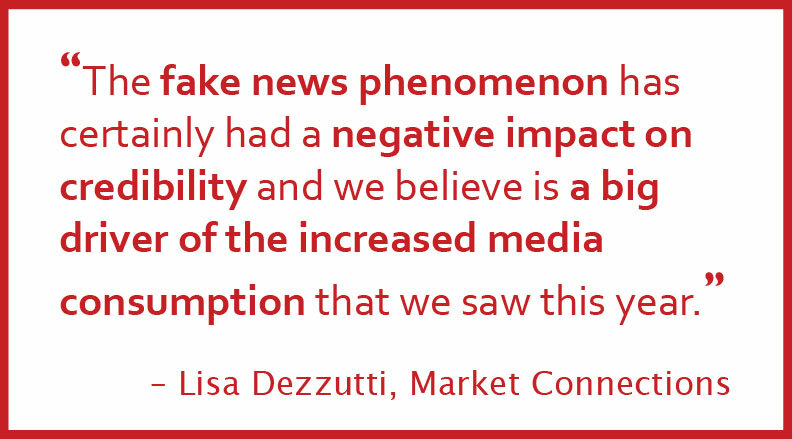 The fake news phenomenon has certainly had a negative impact on credibility and we believe is a big driver of the increased media consumption that we saw this year. Q: What were your biggest surprises from this year’s study? A. What surprised us the most was the increased media consumption this year. Overall media consumption was up across all major outlets, even in print. We measured over 200 different media properties. We saw an increase across nearly all of them, with very few exceptions. In most years, consumption will go up for some, down for others. It’s usually not a significant change. This year, most media outlets were up. I think what we’re seeing is a natural outcome of fake news and conflicting statements we see in the media when reporting on government. That takes people to multiple outlets rather than a single favorite source of news. They are fact-checking or getting different opinions before making their own decisions. Access to multiple news sites on our digital devices makes it easy to do this. The combination is driving increased consumption. One other surprise was how many people in government said they have no plans to retire and no idea when they will retire. You would expect that people know when they plan to retire. Q: Any hints into what new questions will be included in next year’s survey? Or, are you willing to make any forecasts? A. The next survey will be our 10th. We’ll do something special – something that’s worthy of our 10-year milestone, but I can’t share what. I do believe that we will see media consumption remain up and the fake news phenomenon continue. I believe that social media will remain strong, despite the pressure that a lot of those outlets have experienced with fake news. Facebook will continue to be a tool that connects people. There may be some others that gain momentum in the coming year, but they’ll have a tough time overtaking Facebook. Q: Mark Zuckerberg surprised us with his plan to de-prioritize posts from businesses, brands and media in Facebook news feeds. Do you expect that Facebook will still be the top online social site for 2018? A. I do. I think people are on Facebook to connect with friends and family and the eyeballs will be there. I’m sure we will see some differences by age, but our federal workforce is older, and I don’t think we’ll see a lot of change in terms of their Facebook consumption. Q: If you could share one piece of advice to government marketers and business development professionals, what would it be? A. There are so many ways now to reach federal decision-makers. There’s an opportunity for federal marketers to use many different media outlets to engage their audience, build their frequency, build their reach. The study shows that people are more engaged with media and that’s a bonus to everybody who’s looking to capture the attention of government executives.The trick is to make sure 1) you have the right message and 2) you’re reaching them with the right tool. You’ve got to be where your customers are. Thank you, Lisa! We really appreciate your insights and are looking forward to the 10th annual survey results later this year. A you can see, the federal media landscape is ever changing, which is always exciting for us. It keeps us marketers and BD folks on our toes; innovating and adapting to reach and engage the federal government. Our team prepared this executive summary of some 2017 Federal Media and Marketing Study key findings. To learn more about the study and download the full report, visit the Market Connections website.